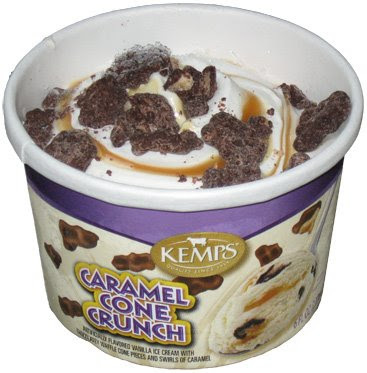 I haven't seen any full size Kemps containers at Walmart, or any where else for that matter, but now and then I do spy "snack cups" (for lack of a better word). Let's just hope this little guy is better than the Yogurt one. The good new is this is a respectable little treat, even though it has suffered a bit of freezer burn (as you can see at the top of the picture). It's one of those middle of the road treats that may not knock you off your feet, but it satisfies your cravings. The caramel was were I like it, not too potent and not too weak. A nice touch is the fact that the cone pieces are on top, and there are some in the middle. At just a dollar, this was definitely tasty enough that I would pick up other flavors if I saw them.